Imagine Toys #Giveaway (2011 Holiday Gift Guide) CLOSED! When I was little, it seemed that toys were much simpler than they are now. Christmas to me was about getting those toys that I waited all year to ask Santa for. I remember getting a board game for Christmas and playing with it with my friends many times over. Battleship was the game that was the coolest thing to have. Cabbage Patch dolls were the must have, and every one of my friends had to have one. These dolls did not do anything special, they had yarn for hair, but they came with a adoption certificate and I just had to have one. Little did I know that the same year I had to have one, every other little girl in the country had to have one as well, so my poor mom had to hunt a doll down to make her little girl happy and make sure she kept her innocent belief in Santa alive. Getting coloring books was the coolest thing. So on snow days, in between sledding and playing in the snow, my friends and I would play our board games and color while thawing out and drinking hot cocoa. Those days may be long gone for me, but I can try to bring them back for my own kids to enjoy. My son is three and he does not require a gaming system at the time to entertain him. He is very satisfied with some blocks, puzzles and cars that he can roll around and race down the hall. Well for this holiday season, we were sent some toys from Imagine Toys for my kids to review. My son was sent a toy that reminded me of the kind of toys my friends and I used to play with. He was sent a SmartCar. Now you might think of a electric car when you hear of a SmartCar, but that is not at all what this is. In fact this car is a very simple car. It is a puzzle, block car, and this car is right up my sons alley. He loves being able to take apart, then rebuild his car, then race it down the hall. My son can sit and be perfectly content with such a simple toy. I love that this toy is not only simple, but is also a game that my son can play all by himself. It teaches strategy and logical thinking. My son loves this car and I think that this is a great toy for my son to play with, it not only rolls around for him to race, but it is also a teaching toy, which is a huge plus for me when it comes to toys for my kids!! My daughter was sent a toy, that is also something I would have just loved as a kid. She was sent a Smart Lab Spa Day set. I remember having slumber parties when I was my daughters age, and at the slumber parties we loved doing make overs and each others nails. My daughter has been quite busy since school started, but she has been able to use this set with some of her friends on the weekends after a game. 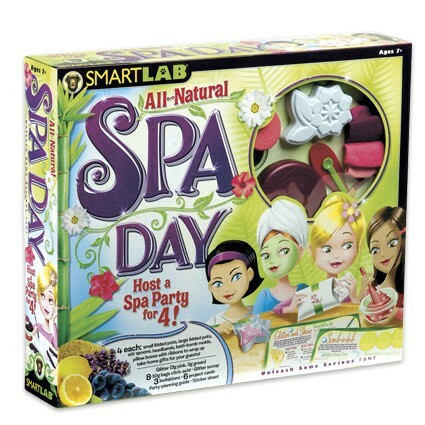 I love that there are tools in the set that give my daughter the chance to plan a spa day party for her and her friends. Then when the girls came over they began making the spa products to use on each other. They also made these bath bombs that they were able to take home with them after they were done playing with the set. This would have been the kind of set I would have loved playing with when I was little. So simple, yet so much fun and it helps bring out that creative side of the kids, which I just love to watch. Well this year for the holidays, the wonderful people from Imagine Toys would like to give one of my amazing readers the same two products I was sent for my kids, for one of my readers to share with their own kids this holiday season!!! Tell me what other toy you like from Imagine Toys! Please leave me your email with this entry!! This giveaway is open to US residents. This giveaway will end at 11:59 pm on November 29,2011. Winner will be chosen at random.org and will be given 48 hours before another winner will be chosen. All products for reviews and giveaways are given as a sample from the companies. All opinions in reviews I conduct are my own. I was not paid to say anything or review any products. Previous Post Take Me Fishing $100 #Giveaway Bass Pro Shops (2011 Holiday Gift Guide) Closed! Next Post Pam Cooking Spray Mission #Giveaway (2011 Holiday Gift Guide) CLOSED! I have liked your FB page as Vicky. I like the 3-in-1 Sports Arcade. I like the cookie kit.